India's internet pharmacies are seeing their businesses shrink and struggle in the face of myriad hurdles. A crisis in their personal life made Ajay Gandotra and his wife Nishi think of starting their own pharmacy business. Ajay's mother was detected with cancer five years ago in Delhi. At the time the couple was settled in Dubai - Ajay was a banker while Nishi had her own business in communication and marketing. Ajay's mother was rushed to a leading private hospital in Delhi. The doctor suggested 17 chemotherapy shots, each costing Rs 1,35,000. The couple was further instructed to purchase the drugs only from the hospital's pharmacy. The prohibitive cost of the treatment forced Ajay to shift his mother to Sir Gangaram Hospital. He also managed to buy the same drug from his neighborhood pharmacies at a cost of Rs 55,000 per vial. The incident prompted Ajay and Nishi to think of returning to India and starting an online pharmacy that can supply drugs to needy patients at affordable prices. But officials showed them the rule book - only pharmacists can get a licence for a medical store, whether virtual or real. They then hired pharmacists, set up three medical shops in Gurgaon, and invested in IT infrastructure for their venture SaveOnMedicals.com, spending some Rs 35 lakh. All this was around two years ago, when online aggregator models were becoming viral across various businesses. But the couple soon realised that realities are different in the drug sector. Private Equity (PE) investors told them to wait for funding till the "regulatory framework gets more clarity". The neighbourhood pharmacists who promised supply of drugs backed out with their associations directing them not to supply to online traders. "We get only 35-40 orders per day online and one fourth of the orders have to be declined because either there are no prescriptions or they are too old," says Nishi. The story of Gandotras is not an exception. 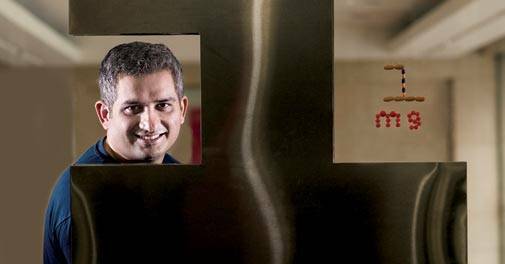 At least 30-40 serious internet-based pharmacy start-ups have come up in the past two-three years hoping to replicate the success of the Flipkarts and Snapdeals in the Rs 80,000 to Rs 90,000 crore a year drug market in India. In fact, IMS Health had earlier projected the market to grow to over Rs 1,00,000 crore by 2016. E-pharmacies are now facing unanticipated, serious roadblocks and are almost at a dead-end - primarily due to a lack of proper regulatory framework and understanding of the sector and opposition from traditional organised drug traders. Online chains advise patients or their relatives to upload the doctor's prescription, which their pharmacist or the local partner medical shop will verify and deliver drugs home. It can be an additional revenue attraction for the local medical shop owners and once volume grows, the small margins are sufficient to make good profits. Some online chains have tied-up with post-offices or courier companies to deliver drugs. In the US and Europe, about 15 per cent of drug trade happens through legalised mail order pharmacies. Many corporates and PE funds like the scalable business models of online pharmacies. Gurgaon-based Bright Lifecare, operator of the online drug marketplace 1mg, got Rs 100 crore ($15 million) funding from Maverick Capital Ventures, the venture capital arm of US-based hedge fund Maverick Capital. "We have many private equity investors and these investments are to develop our various healthcare online initiatives including online drug sales," says Prashant Tandon, CEO and co-founder of 1mg and now president of the recently formed Indian Internet Pharmacy Association (IIPA). Another Indian drug start-up that successfully raised funds was Chennai-based Netmeds, which received an investment commitment of $50 million (Rs 325 crore) from healthcare-focused global PE firm OrbiMed. Netmeds promoter Pradeep Dadha is from the promoter family of the century-old Chennai-based Dadha Pharmaceuticals, and has been into wholesale and retailing of drugs in South India for many decades. "We are talking to India Post and planning to supply drugs in 24 hours whereever post offices are available," Pradeep had said in a recent interaction. Apart from Dadha's family investment fund and OrbiMed, boutique investment bank MAPE Advisory Group has also invested in Netmeds. Even established brick-and-mortar retail pharmacy chains like Apollo, MedPlus and Guardian Lifecare have also entered the online segment. High profile techies and seasoned pharma professionals are also in the race. A prominent example is Bangalore-based PM Health and Lifecare, led by former i-Gate chief executive Phaneesh Murthy as chairman. Murthy has invested $2 million in the venture along with other promoters like CSS Corp CEO T. Ramesh and Pune-based Opus group. Murthy's former i-Gate colleagues, Hemant Bhardwaj and Anil Bajpai, also joined PM Health to spearhead the venture. Another large-scale venture in the works is mChemist, promoted by Rajiv Gulati, former president, global pharma business of Ranbaxy Laboratories. The venture is focused on offering a'mail order service' pharmacy for chronic ailments, particularly for patients suffering from hypertension and diabetes. "So far we have invested only our own funds and will look at that once the uncertainties related to the sector gets a clarity," says Gulati. "I think there are some 30-40 serious players in the online space and together may have invested roughly Rs 500 crore to Rs 800 crore in the past one or two years," says Tandon of 1mg. IIPA, launched recently to lobby for interests of the new age pharmacies, now has some 10 members. Opponents of online drug businesses have raised some valid points. They point out that there are no well-defined, dedicated laws for online ventures, though pharmacies in India are governed by the Drug and Cosmetics Act 1940, Drugs and Cosmetic Rules 1945, Pharmacy Act 1948 and the Indian Medical Act 1956. Laws related to ecommerce are defined under the Information Technology Act, 2000 but those are also silent on e-pharmacies. "I think there are some 30-40 serious players in the online space and together may have invested roughly Rs 500 crore to Rs 800 crore in the past one or two years"
According to Indian laws, a chemist can dispense prescription drugs only on a doctor's prescription - it requires the name of the doctor, his address and registration number besides the names of the drugs, their potency, dosage, and duration for which they are to be supplied. The chemist cannot dispense quantity in excess of what has been prescribed by the doctor. Before dispensing the drugs, the pharmacist is expected to verify the authenticity and legality of the prescription. Even over-the-counter (OTC) drugs can be sold only by licensed retailers. The online sale of drugs is potent enough to kill the sanctity of the relationship and faith between a doctor and a pharmacist, they argue. The Indian Medical Association (IMA), which brought out a position paper against online sale of drugs, says that prescriptions submitted via fax or email can be fake and it could be difficult to verify their authenticity. 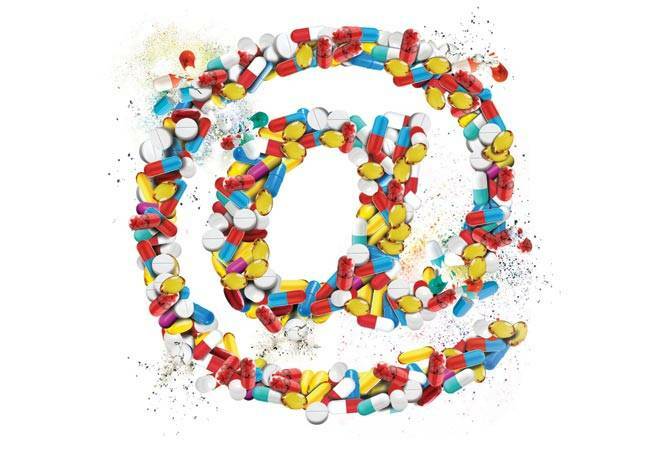 Online correspondence or scanned copies are legally not permitted and online pharmacies will promote drug abuse, drug misuse and self-medication. The association also says that such sales can jeopardise the post-marketing surveillance of new drugs for adverse reactions. New-age entrepreneurs are not the first to target the huge and growing retail drug market in India. In 2007, Anil Dhirubhai Ambani Group (ADAG) was eyeing pharma retailing with a large distribution backbone and plans of directly sourcing drugs from manufacturers. For this, the group had hired Rajendra P. Gupta, former Indian CEO of Medicine Shoppe, one of the largest drug retailers in the world. 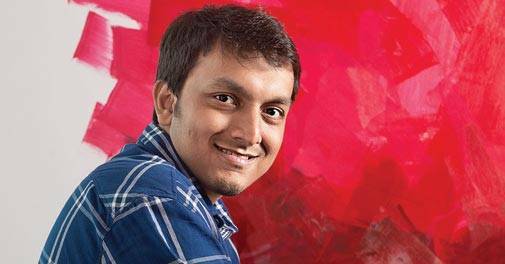 But the venture did not take off and Gupta left Reliance Health within a few months. At that time many domestic retail chains like Mukesh Ambani's Reliance Retail and Subhikha had also thought of sourcing drugs directly for their pharmacies, but could not implement the plans. 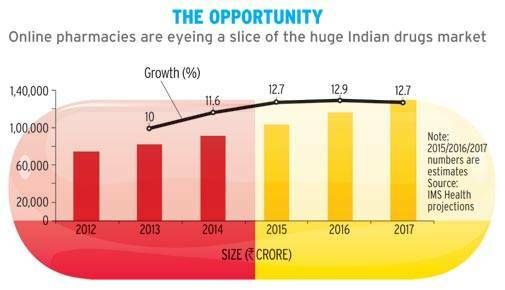 Even the global drug retail biggies failed to penetrate Indian shores. The biggest among them was US-based drug retailer Cardinal Health, which came to India and explored options for direct sourcing from drug companies. Online pharmacies, too, have struggled to build a viable drug sourcing model. Direct sourcing from manufacturers has remained out of bounds because of the opposition from brick-and-mortar pharmacies. Currently, India is estimated to have over 500,000 medical shops and most of them are unionised under one association, the All India Organisation of Chemists and Druggists (AIOCD). Every two-three years, drug manufacturing company associations, such as Indian Pharmaceutical Association (IPA), Organisation of Pharmaceutical Producers of India (OPPI) and Indian Drugs Manufacturers Association (IDMA), negotiate with the trader's lobby to jointly decide the margins for the wholesale and retail trade. Industry insiders say that the aggressive traders association forces manufacturers to stick to the existing trading channels for supplying medicines. On several occasions in the past, they have enforced boycott of leading drug companies for not meeting their demands. "In most countries, the legitimate players are given specifi coperating licences. We should also incorporate such rules. Internet pharmacy is a reality in modern era"
When Internet pharmacies became a reality and started enrolling retail shops as their partners, AIOCD was the first to initiate strong opposition. Business Today was the first to report in July last year about their plan to go on strike to protest against allowing internet pharmacies. "We are not going to allow e-commerce of medicines and that is against the ethics of our profession. There is a difference between the profession of dispensing drugs and seeing this as a business for profiteering," J.S. Shinde, President of AIOCD told Business Today. Traders also highlight the dangers of having internet pharmacies. It could lead to drug abuse as even children can purchase psychotropic or controlled substances online, they say. AIOCD brought up the issue with the Drug Controller General of India, health ministry officials and the Prime Minister. In mid-October, medical shops nationwide remained closed for a day protesting against e-pharmacies. The Drug Controller General of India (DCGI) also directed all the state/Union Territory drug controllers to keep a strict watch on online sale of drugs and take action against those selling in violation of the Drugs and Cosmetics Act and Rules. A public interest litigation (PIL) was also filed in the Bombay High Court against allowing internet pharmacies, and the final verdict is yet to come. Soon, the government started taking action. An eight member sub-committee of the Drug Consultative Committee under the chairmanship of Maharashtra Food and Drug Administration (FDA) Commissioner Dr Harshdeep Kamble was formed to formulate guidelines on the use of information technology in online pharmacy. "Though the committee was supposed to submit its recommendations months ago, it has not yet come out with its suggestions", says Tandon of 1mg. Industry body FICCI, which was asked to give its views, is likely to soon submit a white paper on the subject, say industry sources. There have been concerted efforts by regulators and pharmacy associations globally to ensure that the Internet is not misused for sourcing of controlled drugs. In the US, legal Internet-based pharmacies are accredited by the National Association of Boards of Pharmacy (NABP) through the Verified Internet Pharmacy Practice Sites (VIPPS) or Vet-VIPPS (for veterinary pharmacies) certifications. The VIPPS pharmacy sites can be identified by the hyperlink seal displayed on the home page. The 116-year-old NABP assists state licensing boards in developing, implementing, and enforcing uniform standards in the United States, Columbia, Guam, Puerto Rico, the Virgin Islands, eight Canadian provinces and New Zealand. Canada also follows a replica of the VIPPS certification process. The 14-year-old Canadian International Pharmacy Association (CIPA) allows member pharmacies to display Certified Canadian International Pharmacy (CCIP) logo. It is ensured that they follow CIPA standards practice and follow ups with regular on-inspections and audits. In the past four years, France, Italy and Austria have cleared legal hurdles and allowed their domestic businesses to enter the online pharmacy sector. Founded in 2000, the European Association of Mail Service Pharmacies (EAMSP) represents European mail order and online pharmacies and caters to over two million customers daily in various European countries. It is estimated that there are around 7,000 authorised e-pharmacies operating, mostly small-scale, independent, local businesses. Others are larger cross-border 'pure play' mail order pharmacies and many are integrated into the multi-channel strategies of leading pharmacy chains. All members of the EAMSP have an operating licence and a mail service business licence of their home country. Most of the Acts governing the pharmaceutical sector were framed in an era when modern communication tools were not even invented. In May last year, the Food and Drug Administration (FDA) of Maharashtra had filed a case against e-commerce major Snapdeal, its distributors and officials for selling prescription drugs online. The regulators in Gujarat had also initiated action against online pharmacies for the same reason. There are several other instances of the authorities initiating action again online pharmacies. IIPA says that the government should act against the menace of cross-border internet pharmacies and should incorporate the best practices across the globe. "The National Association of Boards of Pharmacy (NABP), the apex pharmacy body in the US, provides registration and certification after verifying the functioning of e-pharmacies who can display the certification logo on their website. It helps consumers understand whether e-pharmacies are legal or not," says Rajiv Gulati. In most countries, the legitimate players are given specific operating licences, points out Dharmil Sheth, Founder and CEO of PharmEasy. "We should also incorporate such rules. Internet pharmacy is a reality in the modern era," he says. The existing statute does not appear to permit online sale of drugs, according to G.N. Singh, Drugs Controller General of India (DCGI). "A high-powered committee of experts is examining this issue and we are awaiting their report. The issue is very complex. The US and Europe and other countries are struggling with this. We want to use this technology, but only after complying with all regulatory requirements," he says. All stakeholders then believe that the time has come to frame a regulatory framework for online pharmacies. Indeed, it is the need of the hour.